11 A None No Power Seat 11 A is a standard Economy Class seat. Seat back recline might be limited due to an Exit Row located directly behind. 11 C None No Power Seat 11 C is a standard Economy Class seat. Seat back recline might be limited due to an Exit Row located directly behind. 11 D None No Power Seat 11 D is a standard Economy Class seat. Seat back recline might be limited due to an Exit Row located directly behind. 11 E None No Power Seat 11 E is a standard Economy Class seat. Seat back recline might be limited due to an Exit Row located directly behind. 11 F None No Power Seat 11 F is a standard Economy Class seat. Seat back recline might be limited due to an Exit Row located directly behind. 30 A None No Power Seat 30 A is a standard Economy Class seat located in the last row of the aircraft. Seat back recline might be limited due to the wall of the lavatory directly behind. Also, if the seat back in front is reclined, then there will be a reduction of personal space. The close proximity to the galley and lavatory area might be bothersome. 30 C None No Power Seat 30 C is a standard Economy Class seat located in the last row of the aircraft. Seat back recline might be limited due to the wall of the lavatory directly behind. Also, if the seat back in front is reclined, then there will be a reduction of personal space. The close proximity to the galley and lavatory area might be bothersome. 30 D None No Power Seat 30 D is a standard Economy Class seat located in the last row of the aircraft. Seat back recline might be limited due to the wall of the lavatory directly behind. Also, if the seat back in front is reclined, then there will be a reduction of personal space. The close proximity to the galley and lavatory area might be bothersome. 30 E None No Power Seat 30 E is a standard Economy Class seat located in the last row of the aircraft. Seat back recline might be limited due to the wall of the lavatory directly behind. Also, if the seat back in front is reclined, then there will be a reduction of personal space. The close proximity to the galley and lavatory area might be bothersome. 30 F None No Power Seat 30 F is a standard Economy Class seat located in the last row of the aircraft. Seat back recline might be limited due to the wall of the lavatory directly behind. Also, if the seat back in front is reclined, then there will be a reduction of personal space. The close proximity to the galley and lavatory area might be bothersome. 5 C None No Power Seat 5 C is blocked for use by the Business Class passenger in adjacent seat. 5 E None No Power Seat 5 E is blocked for use by the Business Class passenger in adjacent seat. 6 C None No Power Seat 6 C is blocked for use by the Business Class passenger in adjacent seat. 6 E None No Power Seat 6 E is blocked for use by the Business Class passenger in adjacent seat. The Swiss Bombardier CS300 aircraft is operated on short-haul routes. This CS300 features a 2 class configuration with 30 Business Class seats and 115 Economy Class seats. SWISS blocks all C and E seats in Business Class to provide a sense of more space. 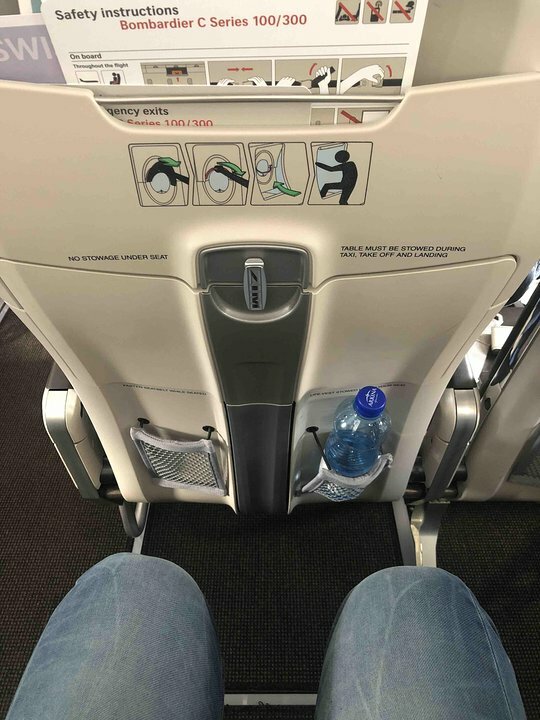 Comfy seat, reasonable leg room, nice features like convenient coat hook, close to front of aircraft for exit, wine, coffee, water complimentary plus decent sandwich too on LHR-ZRH. 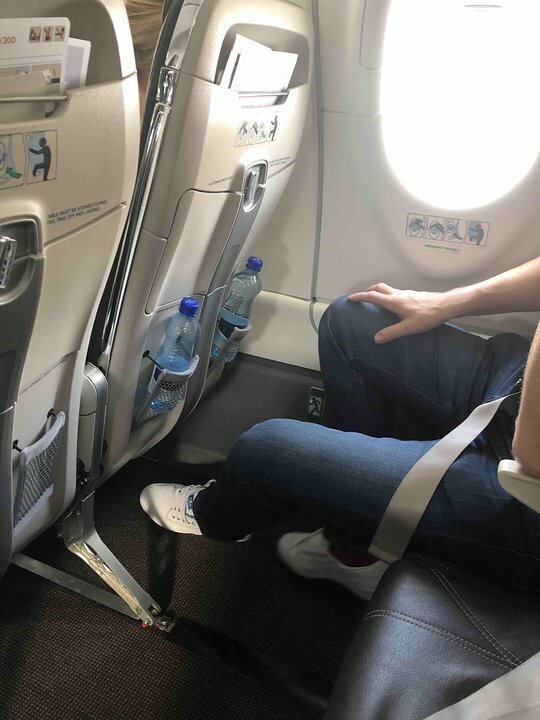 Excelent seat, plenty of room for your legs. The plane itself is very modern and good looking, all brand new. The service is fair. Noise reduced. Screens not on the back of the seat, but on top of your head with indication of a map. Seats 1A-1F have VERY small armrest traytables. Furthermore these cannot be pushed forward very far at all. Hence if you are large, you can only eat from your belly button with the risk of dropping the small tray onto your feet, and if you are XL you cannot use it at all. So new - so wrong! Furthermore the overhead baggage bin for the 1D-1F section is reserved for crew baggage only and even has a key lock for that purpose. More legroom than one could really ever need. The window armrest is quite short, about 6 inches (15 cm), and essentially useless. No under-seat storage here. SWISS flies 1 versions of Bombardier CS300.